Imagine getting through an entire month without computer problems, network support issues or unbudgeted hardware repairs -- because any concerns are resolved before they become emergencies. Imagine being able to focus on your core business competencies while your trusted IT network support partner keeps your workstations and network servers running at peak performance -- at a cost less than the annual salary of a single in-house IT technician. Net eWareSM TurnKey IT makes that ideal working environment a reality. 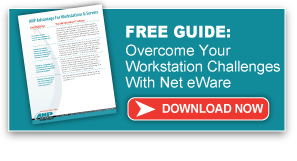 Net eWare is different from traditional network support -- it’s a systematic process designed to minimize computer problems that are disruptive to your organization. By catching small issues before they become big problems, your company saves both time and money. Designed for companies with at least 30 PCs and 1 Server. Say goodbye to downtime and lost billable hours due to computer problems. Say hello to increased profitability, productivity and peace of mind. 24/7 Monitoring -- Your workstations and servers are automatically monitored for issues that have occurred or are developing on your equipment. Other functions, such as ticketing and notification, are also automated. Integrated View -- View the status of your network infrastructure -- including WAN, LAN, Server, Security and IP Telephony information -- all in one place. Support -- Enjoy support for heterogeneous workstation and server environments, and for a broad range of platforms and operating systems. 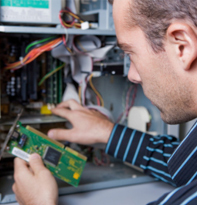 Solve your computer problems and get the network support your business needs today.